A young biracial girl searches for the perfect color word to describe herself in this picture book with a universal theme of self-identity. Simone wants a color, one that will show who she is inside and out. This engaging and beautiful picture book follows a young biracial girl named Simone as she searches for her own place in the world. She wants to find the perfect color to understand her heritage, a color that isn’t brown or pink or black or white. Eventually, Simone creates a special word to describe the combination of her mom's dark and her dad's light skin colors: honeysmoke. Through simple text, this heartfelt and inspirational story empowers all children to forge their own unique identity. Monique Fields is an award-winning journalist. Her essays about race and identity have appeared on air, in print, and online, including NPR’s All Things Considered, Ebony magazine, and TheRoot.com. 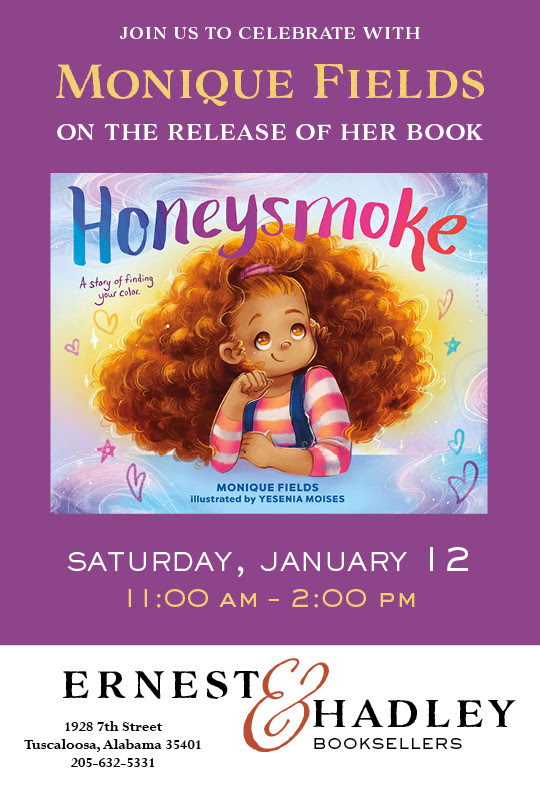 She is the founder and editor of Honeysmoke.com, a site for parents raising multiracial children, and she is a member of the SCBWI. Monique lives in Alabama with her husband and their two daughters. Copyright © 2019 Ernest & Hadley Booksellers, All rights reserved. Thanks for signing up on our email list!